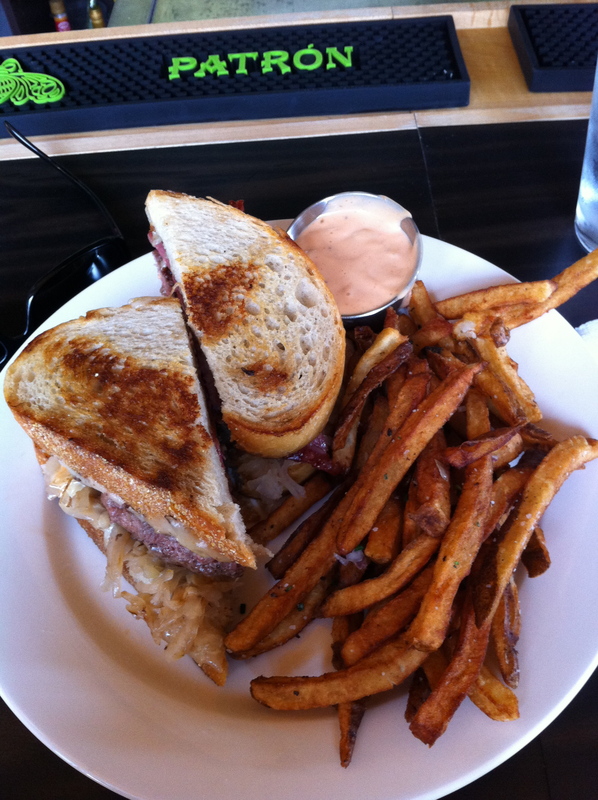 Reuben Burger at PYT | DidjaEat? Before I was to attend what would turn out to be only the second No Hitter in the history of playoff baseball, I had a meeting at PYT in the Piazza. The Piazza is a big apartment complex where the bottom floor is a collection of shops, bars, restaurants and whatnot with a big courtyard (or, a Piazza!…ah-ha!) for bands to play, games to project and markets to peruse. PYT is a burger bar in there. I had not been there, and had only been to the Piazza once to visit my friend Doctor Satan, who was one of the first people to sign a lease there. So, I checked out the website and drove on over. It is a cute place, bright and happy, has a super clean (a pet peeve of mine) bar and friendly staff. 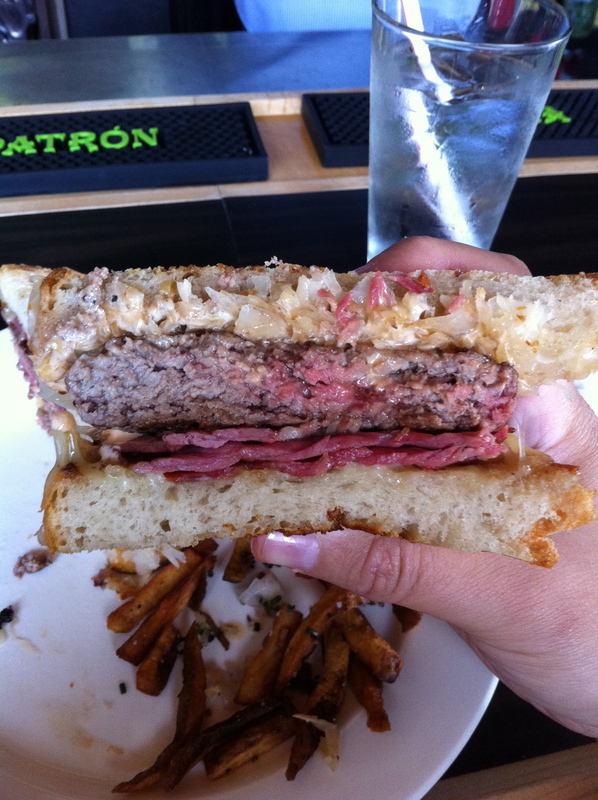 They do burgers of the week, and while I had some time to kill, I decided to order it….The Reuben Burger! They start with bread from one of my favorite bakeries, Kaplan’s, at 3rd and Brown. My grandpop used to get bread from there for the holidays and I love their challah and rye. The rye makes an appearance here, all buttery toasty and delicious. What I loved about it is this: the bread is toasty and buttery but not toasted to the point where it rips your mouth apart like a bowl of Captain Crunch. Underneath the thick burger patty is a nice pile of corned beef, and on top is kraut (made with one of my favorite beers, Kenzinger! )and I think some cole slaw. It’s the kind of burger that makes you not want to engage in conversation. Quiet deliciousness. I dig the fries too. Thin fries are easily overfried, overdone to the point where they turn into potato straws, which I hate with the exploding burn of a thousand exploding suns. Coming with the fries is a zippy dipping sauce that I kept dipping my burger in after I hoovered up the fries. It’s a nice spin on the russian dressing you’d get on a reuben in a deli. I am not sure how long this Reuben burger will be on the menu at PYT, so get your collective butts over there and buy one! They have a nice beer selection, and since it’s the Halloween season, why not get a Dogfish Head Pumpkin Ale, one of my faves! You will not be disappointed with this burger or this place. Nine thumbs up! 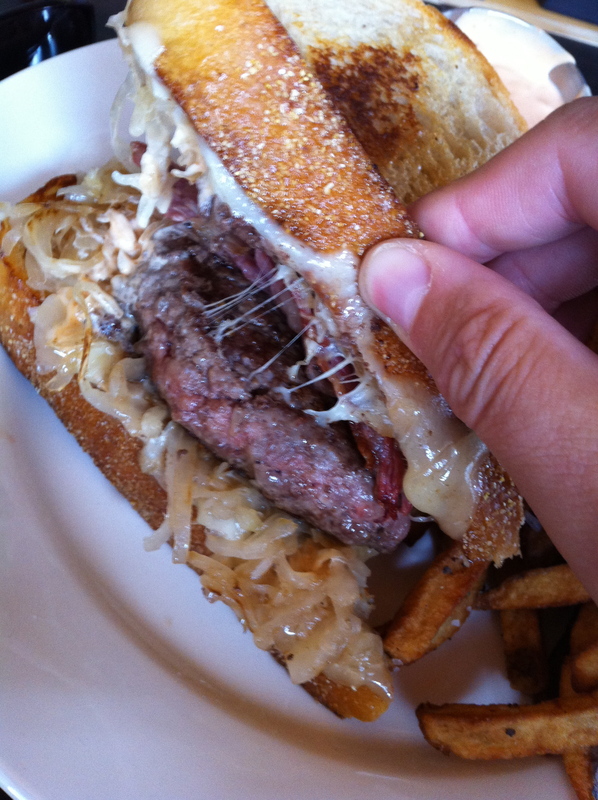 Posted on October 7, 2010, in bar food, bars, restaurants and tagged corned beef, pyt, reuben burger, sauerkraut. Bookmark the permalink. Leave a comment.